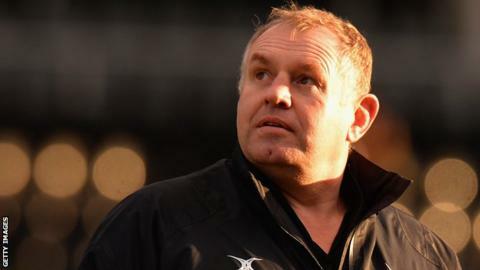 Director of rugby Dean Richards says Newcastle Falcons are looking up the Premiership table after Sunday's victory against London Welsh gave them a 20-point buffer from the drop. Falcons have won four games and picked up five bonus points this term, while bottom club Welsh have lost all 13 of their matches so far. Only one side is relegated from the top flight per season. "Our bread and butter is still the league," Richards told BBC Newcastle. "We'll throw a lot into Europe but at the same time I still want to get up that ladder as high as we possibly can." Victory against the Oxford-based Exiles means Falcons lie 10th, above London Irish on points difference and with more wins than they managed to acquire throughout 2013-14. In addition, Richards's side are second in their European group going into Saturday's game against leaders Newport Gwent Dragons, and a win would make qualification for the knock-out phase highly likely. This season's improvement in form and performances has erased the anxiety which has accompanied the Falcons during their recent Premiership campaigns. Last term's long tussle with Worcester to avoid the drop was only settled in the final weeks of the season, and Richards is sympathetic to London Welsh's current predicament. "With us having been down there we know what it is like," added Richards. "I felt very sorry for them in some respects, but it is professional sport."